How Does an Ambu Bag Work? Helen Messina started writing in 2010. She is a registered nurse with experience in rehabilitation, long-term/subacute care, pediatric/adult home care and has worked in acute care facilities in Florida, Pennsylvania, New Jersey and New York. Messina's specialties include neurology, cardiac and renal care. She holds an associate degree in nursing from Gannon University. In a medical emergency, rescue workers can help a patient breathe using a squeezable bag with a face mask called the Ambu bag. 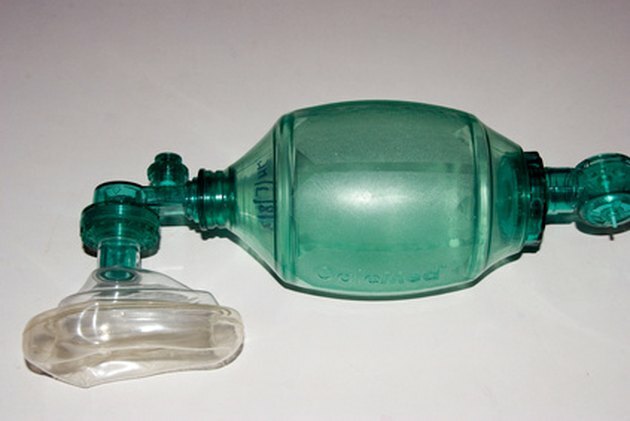 Before its invention, rescue breathing attempts were often futile. Those efforts, including mouth-to-mouth resuscitation, caused more problems than they solved. The problems of abdominal distention, vomiting, aspiration and poor ventilation carried a poor prognosis. The success of the Ambu bag in rescue breathing improved emergency services in rural and urban communities. In 1953, Dr. Holger Hesse, a Danish engineer, partnered with Professor Henning Ruben, an anesthesiologist, to design a breathing apparatus to improve the survival chances of patients in emergencies outside the hospital, according to Ambu USA's website. The product was the Ambu bag. "Ambu" came from the word ambulance and the reference to "bagging" was coined by rescue workers. Hesse and Ruben named the company "Ambu," and it still was in operation in 2010. The Ambu has a squeezable bag, a one-way valve and a face mask. Compressing the bag opens a valve, forcing air through a mask or artificial airway into the lungs, according to the journal "Critical Care Nurse." Releasing the bag closes the valve and exhalation occurs passively through the exhalation port. During exhalation, the bag automatically refills with room air or oxygen. The cycle continues until spontaneous breathing occurs or breathing is mechanically supported by a breathing machine. Pediatric patients require special considerations for head size, facial features, lung size, and tongue size, according to the American College of Emergency Physicians. The back of the head is larger, facial tissue is softer, the lungs are smaller, breathing is faster and the tongue is larger, compared to adults. Attention to head positioning, a round face mask, a smaller bag and an oral airway to hold the tongue in place are considerations for rescue workers. The ability to deliver increased amounts of oxygen via tubing and an oxygen tank improved the Ambu bag's versatility. The Ambu bag proved its merits in the field of emergency medical services and then moved to the hospital area. Placement and use in intensive care units, the emergency room and general care units added to its value. The Ambu bag is also vital to the in home care of patients dependent on breathing machines. The American College of Emergency Physicians recommends certain guidelines to follow for rescue breathing. The guidelines include the right equipment, body positioning, sealing the face mask, adding oxygen and the right number of breaths for the patient. When encountering problems with rescue breathing, the ACEP suggests returning to the guidelines to resolve the problems.